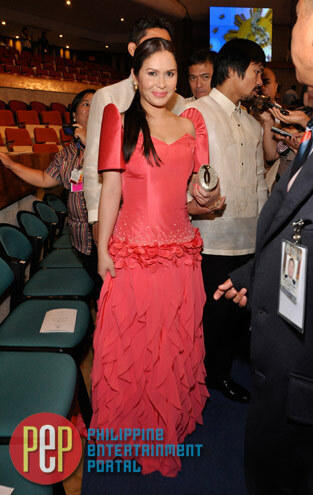 The "First Lady of Philippine Boxing" Jinky Pacquiao is so pretty in pink at the SONA. She looked abloom in the fetching silk shantung terno, with a smattering of crystals on the waistline, above the tiers of wispy chiffon ruffles that make up the skirt. "She just wanted pink!" designer Martin Bautista says of Jinkee Pacquiao, who wore a pink creation of his to today's State of the Nation Address (SONA). "She just wanted pink, so I suggested coral pink." The 4th District Congresswoman of Leyte Lucy Torres Gomez also wears pink dress which bloom her goddess beauty.